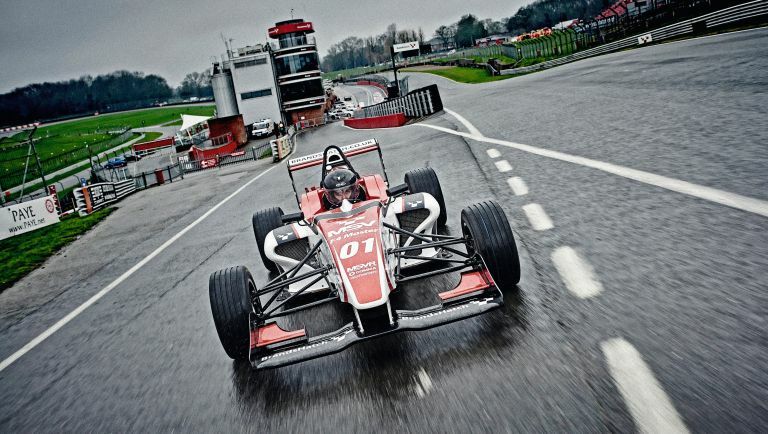 To make it around the famous brands Hatch circuit in a race car, with no experience apart from a few days training on the latest home simulator. Any crashes and he'll fail. Some say Spencer Hart helped Steve Jobs invent the iPhone. others say he can search Google with a chip implanted in his brain. all we know is, he's mobile tech editor at T3.com. But before I could start living life in the fast lane, I actually had to learn how to drive one of these complex machines, and that involved getting together a state-of-the-art home simulator kit. There are some great driving games available for the Xbox One, so I used that as my starting point. Next, I sourced a full-on GT Omega rig, plus a steering wheel and pedals from Thrustmaster, because even Jann Mardenborough couldn't jump straight from an Xbox controller into a single-seater cockpit. There were two games I wanted to focus my efforts on – Forza Horizon 2 and F1 2015. These would give me a varied practice routine, taking in both virtual roads and track driving. All of the kit arrived one Friday in eight separate boxes, from five different deliveries. By the afternoon, my living room was overrun by brown cardboard, and instructions gallantly cast to one side as I scratched my head trying to piece everything together. Two hours later, after a little trial and error (combined with some help from my girlfriend), we had a driving simulator smack-bang in the middle of our living room. I hopped into the chair – sorry, I mean 'car' – and loaded up Forza Horizon 2. This was a good starting point for training because, whereas everything happens incredibly quickly in F1 2015, driving a Fiat 500 in Forza gave me time to become accustomed to my new kit. I depressed the clutch, slotted the gear stick into first, released the clutch and floored the accelerator. The car jumped forward and came to a stop again. After doing this several times, I realised I was stalling the car (I'm more used to simply pulling the right trigger and going forward, arcade-style). I stopped, put my 'real' driver's hat on and started again. With the car in gear and the clutch depressed, I built up revs and slowly released the clutch. The car lurched forward and kept going this time. Result. now a lot more considered and cautious. With the Fiat 500 mastered, it was time to move on to the Formula 1 car (that's quite a step up, I know). In F1 2015's 'Pro Season' mode, all assists are turned off – that means no traction control, ABS and full damage turned on. At first, even getting off the starting line was a problem. I woke up the next morning feeling a little anxious. The weather was awful – it had been raining all night, and it continued to rain throughout my entire journey to Brands Hatch. These were far from perfect driving conditions and something I hadn't planned for. The morning started with a safety briefing; the MSV instructor took me through various flags, showing me how to behave, as well as the braking, accelerating and overtaking points on the track. Brands Hatch while the instructor showed me the racing line. The M4 was much more powerful than the single-seater; it was also much heavier, and featured ESP, making it easier to handle on the wet track. After 15 minutes of the instructor shouting, “Brake! Brake! Brake!” at me, we headed back into the pits for a car swap. I was assigned car number one. It was sheer coincidence, I'm guessing, but this filled me with confidence. Maybe it was a sign… as I later discovered, it wasn't. I slipped on my helmet and stepped into the car. This is where the first issue arose: I'm 6'2”, so climbing into the snug cockpit required gymnast-levels of flexibility. roared as I blipped up through the gears. I reached the end of the straight and joined the circuit. A quick look into the rear-view mirrors confirmed I could barely see a thing behind me. Suddenly, everything felt much more dangerous than in the videogame. I'd forgotten everything I'd learned in the briefings; I was breaking early and missing apexes. My first lap was OK but as I became braver, I started making more mistakes. As I sped down the starting grid and the rain started falling heavier, I tried to wipe the water off my visor, but the first corner arrived sooner than expected. I turned into it, trying to use the whole track on the way out, wracked by the nagging fear that the car could go skidding off at any point. This pumping adrenaline is something even the best simulators lack. an industrial fan and hired my girlfriend to throw buckets of water in my face. Lap three went by even slower than the previous one. I was fighting a losing battle, until on lap four I changed down a gear mid-corner, revved the engine, span the wheels and went spiralling into the gravel. A number of expletives left my mouth. I revved the engine in an attempt to escape the gravel, but the car wouldn't budge. Luckily, I'd parked up with a decent view of the track, so I sat in the car while the remaining cars lapped the circuit. Once they'd returned to the garage, a tractor and two race marshals made their way to my car. I was freed from the gravel, and limped back to the pits with my head hung in shame. When I got out of the car, another driver shouted, “Hey Xbox, did you learn that in your videogame?” Very droll. Liked this? Check out Man vs Tech: can these gadgets stick it underwater?